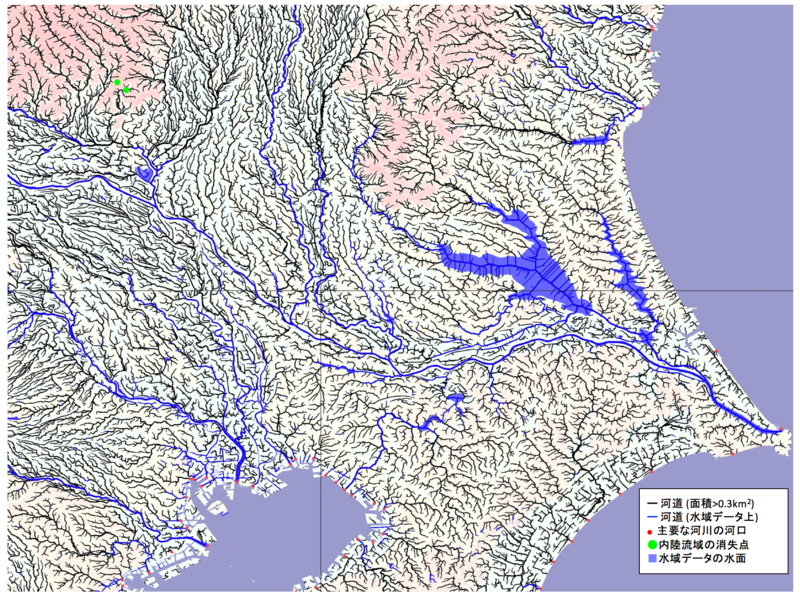 "Japan Flow Direction Map" is developed by the University of Tokyo and Kyoto University, mainly based on the national elevation data and water map from GSI (GeoSpatial Information Authority of Japan). The primary data is the 'flow direction map (local drainage direction)', and supplementary dataset consistent to the flow directions are also prepared. We developed a new surface flow direction datasets at 1-sec (~30m) resolution for the entire Japan domain, using “Kiban Chizu Joho” digital elevation model, “Kokudo Suchi Joho” water body layers and "G1WBM" landsat water body map. The calculation of flow directions for a large domain used to be difficult due to errors in the input elevation data. We solved this problem by a new algorithm, which first calculate the initial-guess flow directions by a steepest slope method, and then ensure river connectivity by reversing the initial-guess flow directions when needed. 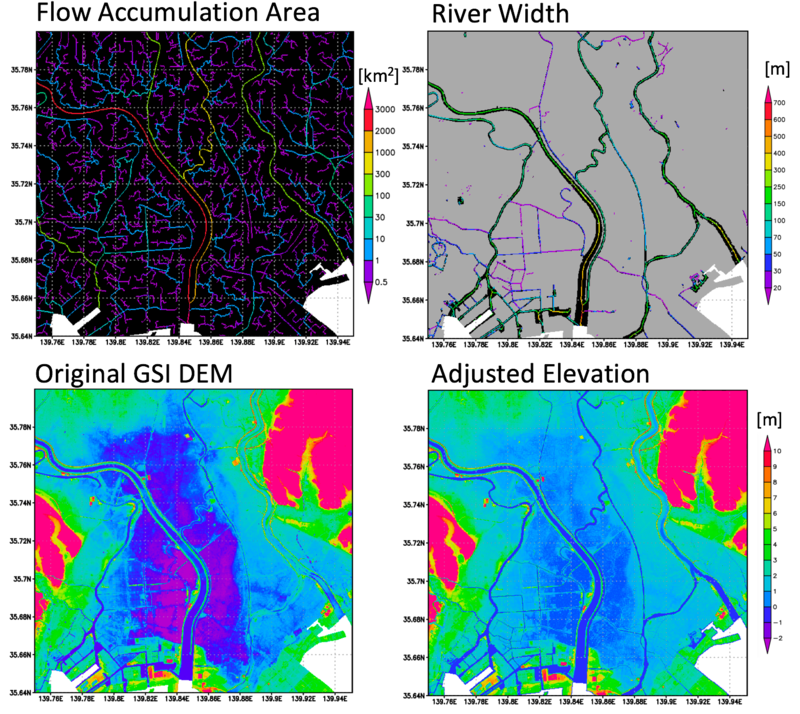 The new flow direction data shows better consistency to the accrual river networks compared to the previous HydroSHEDS flow directions. We also generated supplementary data layers such as flow accumulation area, adjusted elevation, and river width. The new flow direction datasets is considered to advance any geoscience studies which relies on flow direction data. -- The full description paper is available in SUIKO joural (In Japanese with English abstract). -- Yamazaki et al. (2018) "HIGH-RESOLUTION FLOW DIRECTION MAP OF JAPAN"
基盤地図情報 標高データ, 国土数値情報 水域データ, G1WBM Landsat水面マップを用い,日本全域1秒(約30m)解像度で各ピクセルにおける地表水流下方向を表す表面流向データを整備した. 標高データに含まれる誤差などのために広域での表面流向データ開発は困難と考えられていたが, 最急勾配法で算定した表面流向を必要に応じて逆転させるアルゴリズムの開発によって効率的な表面流向計算を実現した. 入力データの高精度化と計算手法の改良により,開発した日本域表面流向データは既存のHydroSHEDSなどと比較して 正確かつ詳細な河道ネットワークを表現することを確かめた. また,表面流向に加えて上流集水面積・水文補正標高・河道幅などの付加的データも,変数間の整合性が取れるように整備した. 開発した表面流向データは水工学に限らず多様な地球科学分野への応用が期待できる. The flow direction datasets is referenced to "WGS84" and "JapanGeoid2011 (GSIGEO2011 v2)". The data is prepared as 1 degree x 1 degree tiles (3600 pixel x 3600 pixel). Filename represents the lower-left corner of the lower-left pixel of the data domain; e.g. the file "n35e135_dem.tif" is for the DEM of the domain N35-N36, E135-E136. The data format is geoTiff. 日本域表面流向マップは, WGS84座標系, JapanGeoid2011 (GSIGEO2011 v2)ジオイドに準拠しています. ファイル名は, ドメインの左下ピクセルの左下角の座標を示します. 例えば "n35e135_dem.tif" はN35-N36, E135-E136の標高データです. Flow direction is prepared in 1-byte SIGNED integer (int8). The flow direction is represented as follows. Adjusted elevation is reprepared in 4-byte float (float32). The elevations are adjusted to satisfy the condition 'downstream is not higher than its upstream' while minimizing the required modifications from the original DEM. The elevation above EGM96 geoid is represented in meter, and the vertical increment is set to 10cm. The undefined pixels (oceans) are represented by the value -9999. For detailed method, see [Yamazaki et al., 2012, WRR]. Drainage area is reprepared in 4-byte float (float32). The drainage area is represented in km2. The undefined pixels (oceans) are represented by the value -9999. Number of upstream grids is reprepared in 4-byte integer (int32). River width is reprepared in 4-byte float (float32), in meter. The values larger than 0 represents the river width at the channel centerlines. The value "-1" represents non-centerline water pixels, and the value "0" corresponds to the non-water pixels. 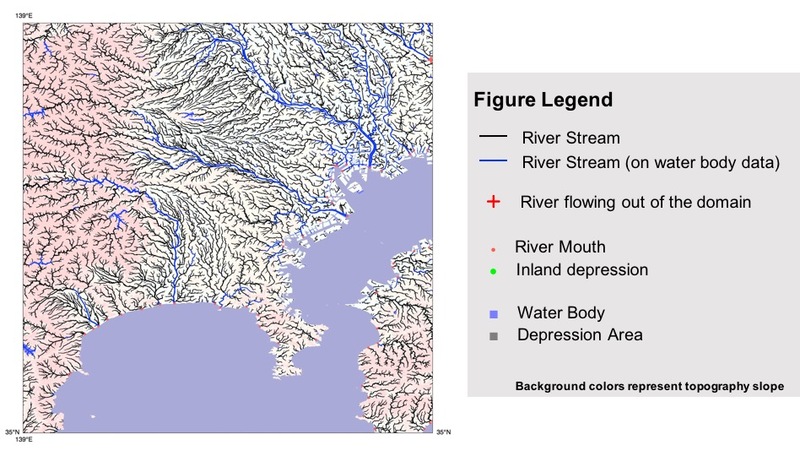 River channel width is calculated by the method described in [Yamazaki et al. 2012, WRR], with some improvements/changes on the algorithm. HAND is reprepared in 4-byte float (float32), in meter. The values represent the height above nearest drainage [Noble et al., 2011, JoH]. Here, "drainage" is defined as pixels with upstream area >0.5km2. In order to quick look the product, the figures visualizing the river netowkrs are acceesible without password. Please download the figure archive from the links below if you are interested in. "Japan Flow Direction Map" is licensed under a Creative Commons Attribution 4.0 International License (CC-BY 4.0). To view a copy of this license, please visit http://creativecommons.org/licenses/by/4.0/. By downloading and using the data the user agrees to the terms and conditions of this license. Notwithstanding this free license, we ask users to refrain from redistributing the data in whole in its original format on other websites without the explicit written permission from the authors. - "Japan Flow Direction Map" is available for download at http://hydro.iis.u-tokyo.ac.jp/~yamadai/JapanDir/. - The copyright of "Japan Flow Direction Map" is held by the developers, 2018, all rights reserved. Citation to the paper is adequate if you simply use "Japan Flow Direction Map". If you asked help for additional handling/editing of the dataset, or your research outcome highly depends on the product, the developer would request co-authorship. "HIGH-RESOLUTION FLOW DIRECTION MAP OF JAPAN"
"日本域表面流向マップ"はCreative Commons Attribution 4.0 国際ライセンス(CC-BY 4.0)でライセンスされます. ライセンス条項のコピーは http://creativecommons.org/licenses/by/4.0/ で確認できます. データをダウンロードすることで、ユーザーはライセンス条項に同意したとみなされます. CC-BY 4.0は再配布可能なライセンスですが, バージョン管理などのため本WebPage以外で、 開発者からの許可を得ずに未加工データ全体をWebなどで再配布することは禁止します. - "日本域表面流向マップ"の著作権は開発者に属します. (2018, all rights reserved). "日本域表面流向マップ"を使用しただけの場合は, データ記述論文の引用で十分です. データ使用にあたり開発者からの追加サポートを依頼した場合, もしくは成果の大部分が"日本域表面流向マップ"に依存する場合は 発表論文などで開発者を共著に追加してください.